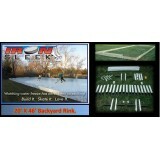 This economy backyard rink liner measures 25' wide and 80' long. It is a 5 mil 3 ply liner that is white on both sides. This is a perfect liner to get started with your first backyard rink. This rink liner is good for rinks up to 20' x 75'. Make it a kit!